The log search allows you to view all accepted, and rejected messages. By using the "Classification", and "Status" options, you are able to fine grain your search to match your specific criteria. While the "Customize" option allows you to define what columns you prefer to be shown. 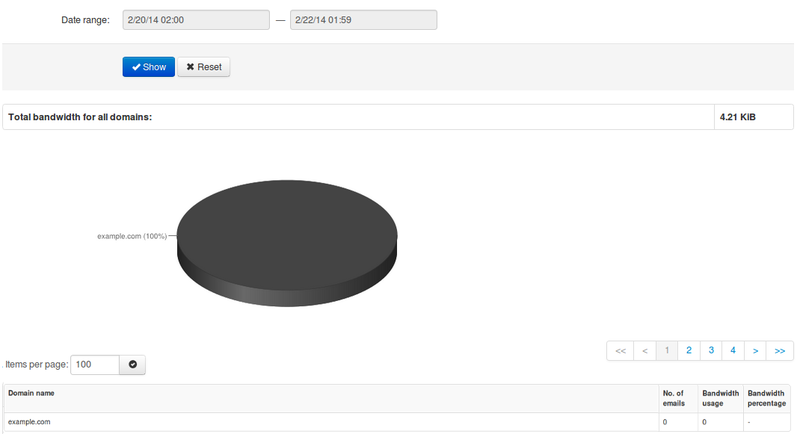 The ESR reports allows you to create one time or timed reports on results from your log searches. Extended details on how you can create reports can be found here. This page shows emails that cannot be temporarily delivered to the destination mail server. Messages that end up here will only be due to temporary issues (4XX error) with the destination mail servers. You can view the content/raw headers of a queued message by pressing the drop-down black arrow on the selected message and View. We have also reintroduced the option 'Error details' to check the reason why messages are stored in Delivery Queue. It is possible to execute “bulk removal” on selected messages by putting a tick in the check box of the selected messages and choose “Remove messages” from the actions at the bottom of the screen. Choosing the “Delete & Report as Spam” option will report the selected message(s) to the training server and delete the message from the queue. If you choose "Reply", this allows you to compose and reply to a message to a sender when the message is queued. 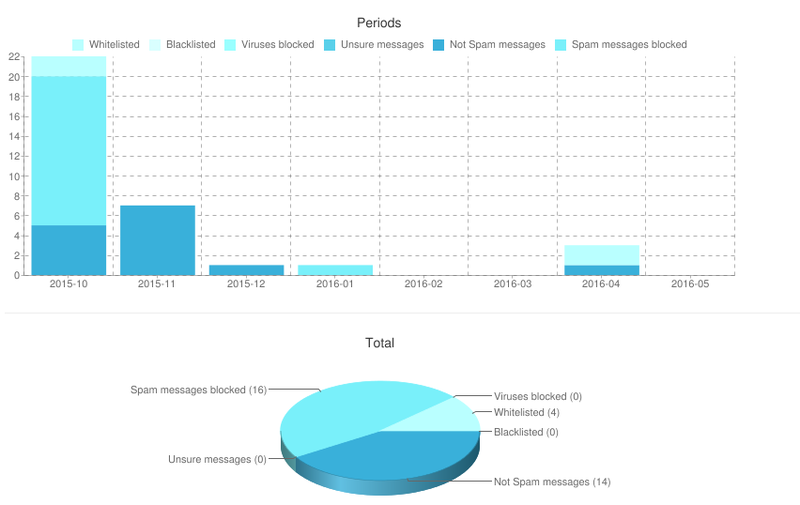 The Spam quarantine interface displays all the incoming quarantined messages. By default, logs are stored in the Spam Quarantine for 14 days. From the quarantine overview, you are able to view the messages and sort or search on specific criteria. The “From:” address is used here to resemble the results an email client would show. Release - This will release the specific message from the quarantine and it will only deliver it to the intended recipient. Release and Train - This will deliver the message to the recipient and train the message as ham into our filtering system. This option is recommended when releasing the messages from Spam Quarantine so that the filters can be correctly adjusted. Release and Whitelist - This will deliver the message to the indented recipient and automatically add the sender’s email address to ‘Sender Whitelist’. Remove - This will delete the message from Spam Quarantine. Remove and Blacklist - This will delete the email and automatically add the sender’s email address to ‘Sender Blacklist’. Please note that releasing messages has effect on your filtering, so releasing spam/virus/phishing emails may have a negative impact on your filtering quality. To view the reason for the blocked message, you will need to look for the “Evidence:” line of the raw header and then compare it against our classifications “page”. With this option you can drag and drop or upload spam messages that passed the filter for immediate training to the systems. The emails should be in .eml, .txt or .msg format and it must contain the full headers, including the filters' additional headers. 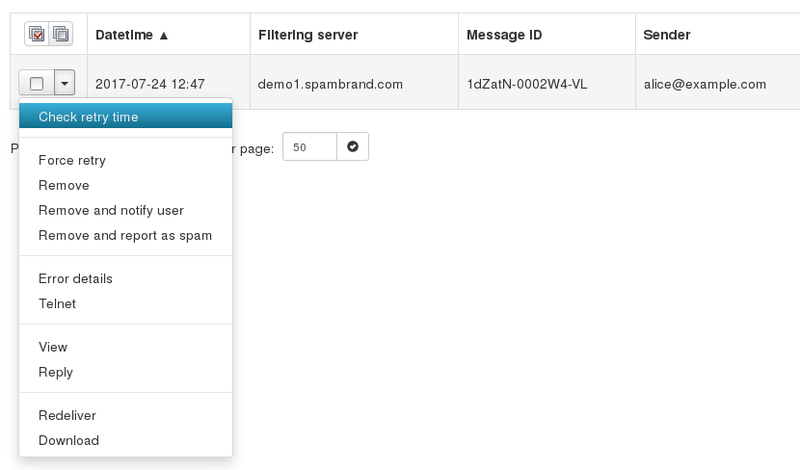 With this option you can drag and drop or upload messages you wish to classify as not spam (ham) for training. The emails must be in .eml / .txt / .msg format and it must contain the full headers, including the filters' additional headers. Here you can search messages that match the specified criteria that have been archived. You can set the text to be found in the field ‘query’. Also you can choose the mode. It may be ‘all’, ‘any’, ‘Boolean’ or ‘phrase’. The Boolean mode allows the ‘&’ (and), ‘|’ (or), ‘-’ ‘!’ (not) operators and grouping ‘(’ and ‘)’ to be used in the query. All archived emails are indexed including readable attachments. They can be searched using any search string. You are also able to view, download or re-deliver the messages to the same of different recipients. When re-delivering please make sure you press enter for each recipient. This can also be done via the log search page, by selecting the messages and using the drop down action "Re-deliver"
Here you can export archived messages for a specified date range to a destination email of your choosing. All the archived emails from that period will be downloaded as individual files in a zip archive. This can also be done via the log search page, by selecting the messages and using the bulk action "Download". The periodic user page allows to enable/disable/remove your current report settings. 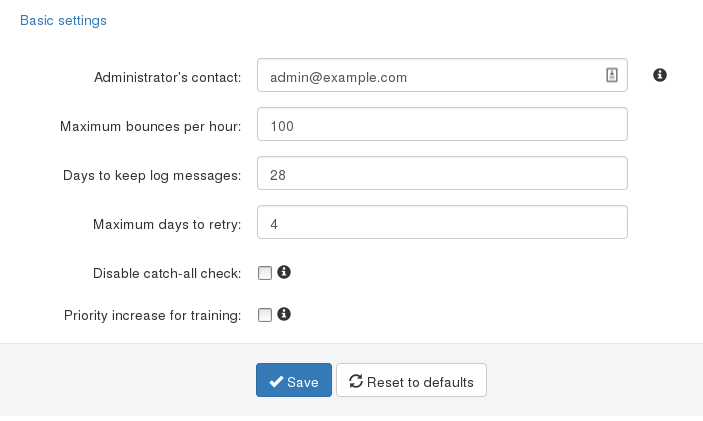 The email user level sender whitelist allows to to whitelist specific senders or domains for the specific recipient. Add the address / wildcard that you want to whitelist. To view the Existing entries, once you get to the Sender Whitelist Section, you need to click on the Show Results button. If no search criteria is used, then all entries will be displayed. If you want to search for a specific address, you will first need to populate the Query Rules. By default, only the Address field is selected. You can adjust this by using the drop down list, or add new Rules by using the New Rule button. 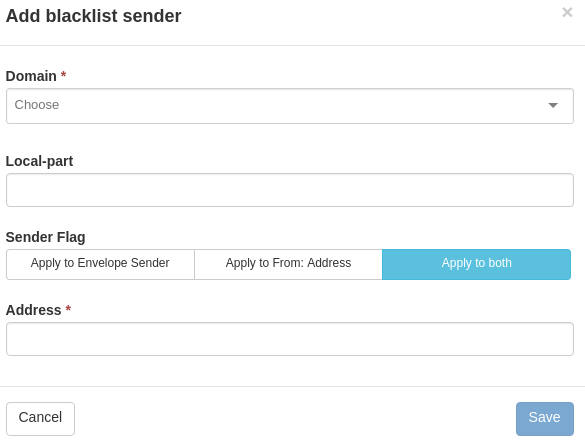 The email user level sender blacklist allows the recipient to add specific senders or domains to the blacklist. To view the Existing entries, once you get to the Sender Blacklist Section, you need to click on the Show Results button. Enabling this option gives the user the ability to be able to view and use new features that are being developed. Pleae note, that as these are previews, they are subject to change at any time. Once enabled, the new options will be shown in the interface with "(preview)" in the icon. To increase the security of your account. This means an additional device (like a mobile phone) will be required in order to log in, so even if someone knows your password they will not be able to take control of your account without your device as well. The Notification option when enabled sends an email notification when the account is accessed from a new/different IP. The following page allows you to compose an email directly from the interface. This isn’t intended to be a full email client, but you are able to set and change the To, CC, and BCC addresses, use rich formatting, and insert links into messages. With the domain settings in the control panel users can control certain domain settings. The default settings apply to all domains that have not yet explicitly set a custom value for the setting yet, and are therefore using the default settings. In this section users can set the maximum bounces, enable/disable logging for invalid recipients, and set accessible/inaccessible logging days for your domains which are using the default settings. You can also activate Direct delivery for email and domain aliases which ensures that when aliasing is in use, the emails will be delivered to the alias address, instead of the original one. This applies to both Email and Domain aliasing. Note that the Log Search will still show the message for the original address. The Rejected Local-part characters are the characters that are allowed in the local part (before the @ part ) of the email address. As regex is used, anything inside the “[ ]” is not allowed. Thus removing a character here will allow that character in the local part. You can “Edit Rejected Characters” by setting up a list of regular expressions. If a local part of the recipient matches any of the regular expressions, then the recipient will be rejected. The advanced domain settings page allows you to configure further options per domain. Here the domain admin contact is set. This is used for password retrieval for domain users. Configurable bounce messages (NDR) per hour per domain. Logging days to be set. Note the larger this is set the more disk space is used. Number of days that a message should be retried in the delivery queue. By default this is 4 days but can be adjusted if needed. Please note, that this only effects new messages when changing and any existing messages that are queued will remain at the original value. If you are 100% sure that users at this domain are correctly training messages, then you can increase the weight of the training process for this domain. Raising this weight will increase the importance of user training as a general filtering factor, thus altering the filtering results. Some automated secondary review processes for messages will be postponed when using this option, meaning that training will have an impact more quickly. Make this change with caution. 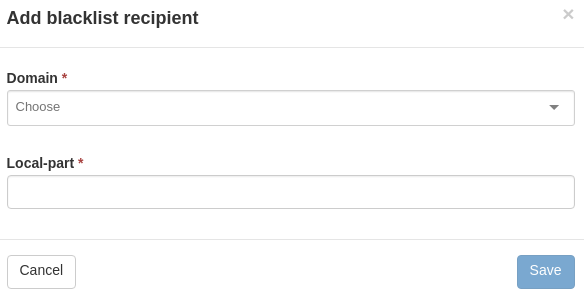 This feature allows email traffic only to recipients already added on the below list, verifying the existence of an email account before accepting the email for it. For uploading a large list, for example thousands of email addresses, you can use the “Upload CSV file” feature which will automatically add the recipients without having to manually add them one by one. With local recipients you have to add all recipients by hand. If you do not add these users, you will not be able to receive emails on that account. We highly recommend only using this feature in specific cases, in normal cases this is not necessary to use. Therefore you have the option to disable the automatic recipient detection system and to enforce a local list of valid recipients. If “Use local recipients” is enabled, the system will only accept email for the listed recipients. Emails sent to not-listed recipients will be permanently rejected. Simply fill in the two fields, “Email Address” and “Email Address Alias”, and click “Add”. Now the email address alias will appear in the list. By selecting it (tick the checkbox) you can remove the alias. Email address aliasing rewrites the recipient at SMTP level to the primary address. The "To:" is not changed. If you have multiple domains, you can make use of the domain aliasing option. Domain aliases can be added to your main domain directly in the web interface. Any email sent to the domain alias will be delivered to the same user on the main domain. Messages delivered to the alais domain will be re-written at SMTP level to the main domain, so the local email part MUST exist on the main domain. Alias domains don’t have separate access to the control panel. Since all SMTP traffic to the domain alias is rewritten to the main domain, any changes/lookups on the main domain will simply include the alias domain traffic as if it was sent directly to the main domain. If you are searching for a specific email sent to a domain alias using the log search, the recipient will therefore show as user@maindomain. With this function you edit the route(s) (destination mail server) and their respective delivery order. You have the option to add and delete routes. Also, the list allows you to dynamically move the order of the routes by drag dropping them to the right position in the list. Whenever there are temporary problems with the first route (e.g. 4xx temporary rejects), we’ll automatically try delivery to the second route. If there are permanent failures with a route (e.g. hostname not resolvable) we’ll directly start rejecting email and won’t try the next route. We recommend not to use your own fallback system, and instead use the filtering cluster to queue your emails if there are problems with your main destination route. Here you can view the statistics for a given time-frame (Hours,Days,Weeks,Months,Years) of your incoming email traffic. With the Filter settings function, you can control the activation of the quarantine system as well as other options. If you disable the quarantine system, emails detected as spam will not be kept in the quarantine system but will be delivered to your destination email server. Under “Spam Notation” you can mark these messages with a specific subject notation. Note that we do NOT return a 5xx reject message for messages classified as spam if the quarantine has been disabled, we do return a 5xx reject message for messages classified as spam if the quarantine is enabled. Every email gets a special header added “X-Recommended-Action: accept” or “X-Recommended-Action: reject”. You can filter the message based on this header if quarantine is disabled. 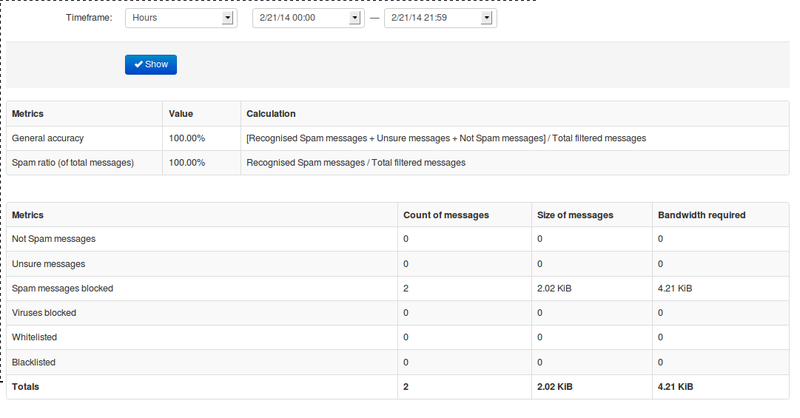 The Quarantine Threshold slider (in red) indicates what score you have set for spam messages. The higher the score, the higher the threshold our systems detect and flag the message as spam. We recommend setting this level to 0.90 to avoid any mail delivery problems. The "Beneficical to train" Threshold slider (in green) indicates at what threshold our systems classify the message as unsure, the higher the number set here, the higher threshold our systems have to reach before we class it as unsure. The default here should be 0.3. This option is primary used when pro-active training is needed. 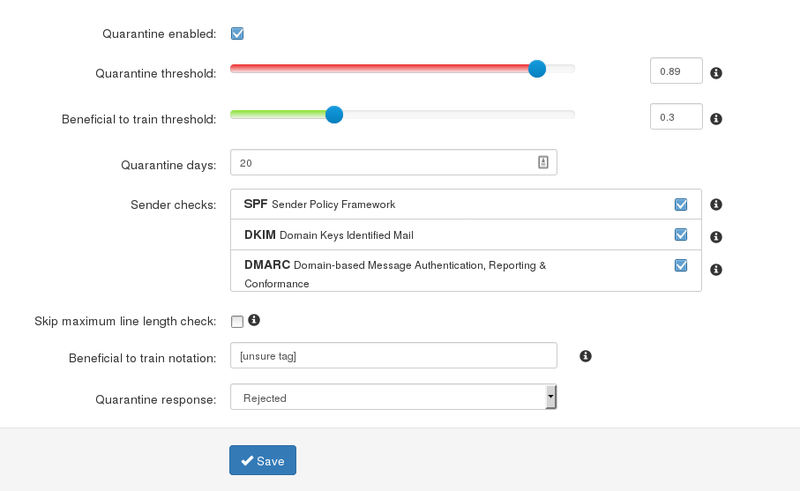 Here you can enable/Disable SPF/DMARC/DKIM related checks per domain. Note in doing this all messages for this domain will have these checks disabled. This means that emails for all the domains using the default settings will not be subject the RFC line length checks. This button clears the "Callout Cache" for the domain in question (the default cache clears all domains - Super Administrator only). By default we cache server responses to 2 hours. For example, if you change a route of a domain you will need to clear the calllout cache for that domain if you do not want to wait for the 2 hour cache to expire. We recommended to clear the callout cache only at domain level of the domain that is having issues instead of clearing the callout cache globally. On this page can generate a DKIM (DomainKeys Identified Mail) certificate for your domain. You will need to choose the desired selector that you chose earlier in the outgoing users section. As a result you will get a value for public key which should be available in your DNS. After successful DKIM generation, you should enable the resulting DKIM certificate for each outgoing user using your selector. On this page you can set the administrator’s contact email for the domain. This address is predominately used for ARF (Abuse Report Feedback) reports. On this page you can generate a SPF record. The system automatically generates the SPF record string along with the current status on the domain. For the SPF Record to become functional it has to be added at the DNS Registrar / Edit Zone page as a TXT Record. This page allows you to view your current logged outgoing Identities. By using the query rules you are able to use fine-grained searching. It's Also possible to lock/unlock either individual or on mass your outgoing Identities. More information on user locking can be found here. The manage users page allows you to view/edit or create your outgoing users. 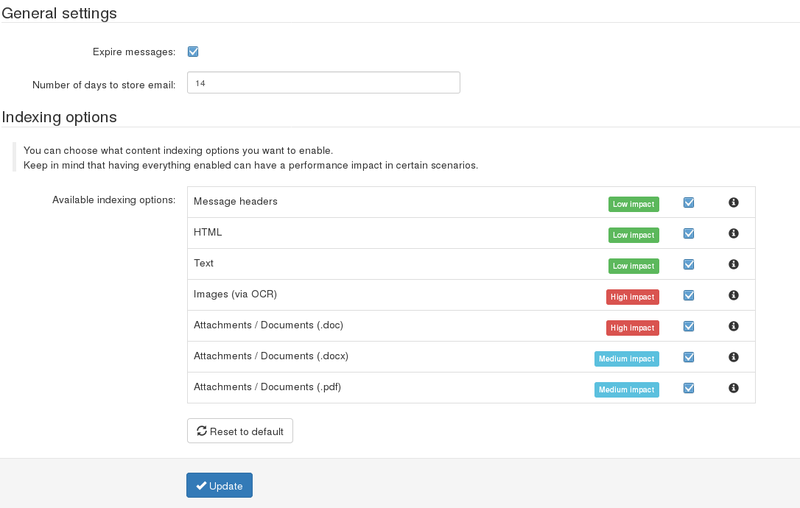 The Outgoing reports page allows you to generate custom reports for outgoing email for a given timeframe. This can either be done for one domain or mutiple (max 500). 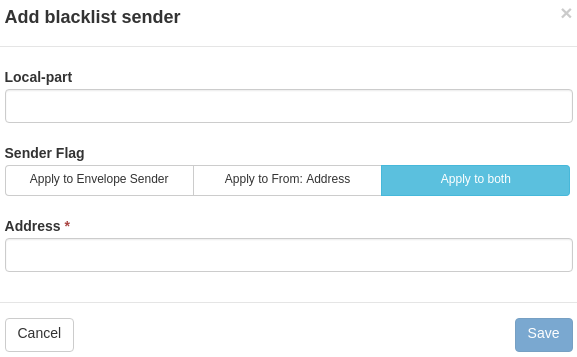 Grouping can be done on either an envelope-sender, identity or from header. Using this feature you can generate a Protection Domain Report for a specified date range, and send it to a specified email address. The format of the report can be either HTML or PDF format. The “Include extra spam table” is only used in the PDF reports, and this adds a table of of messages that were rejected but not quarantined. A daily or weekly report can be generated for your domain (or for specific recipients at a domain) and is delivered via email. Multiple recipients can be separated with a comma. 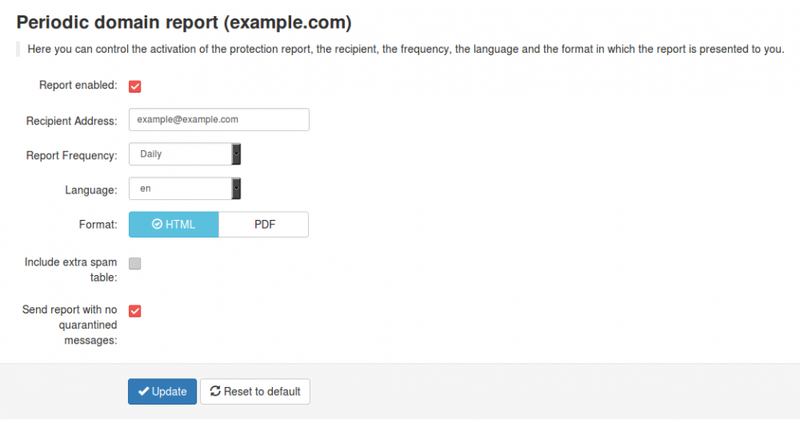 A report can also be generated on-demand from the API/web interface. The PDF report also includes a detailed table (for auditing purposes) of messages that were rejected but not quarantined; this table is configured by default but may be disabled via the API/web interface – it will be very large for some domains. A similar table is also included with the messages that were quarantined, including links to release each message directly. 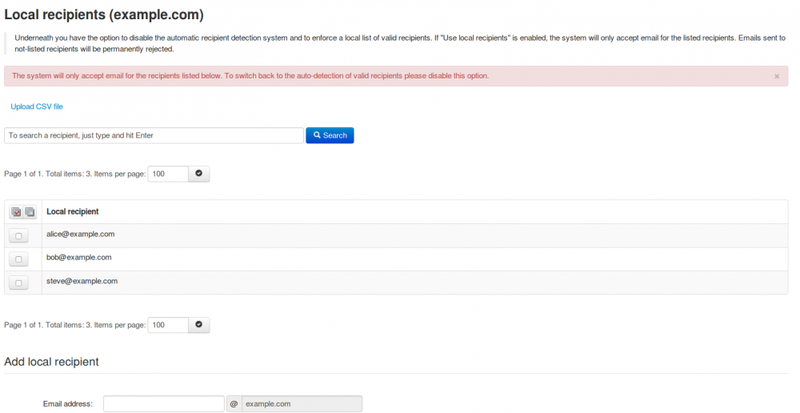 As domain user, with this option you can enable Periodic Protection Reports based on users. You can add users, either individually or via the .csv upload function for multiple users (multiple upload is only available for domain users). Only ASCII characters are supported for the local part. The report will contain an overview of the quarantined messages for a specific user, including links to release each message directly. The option “Automatically activate for all recipient” will automatically add users to the user report list, and then once added, send them a daily or weekly report on the spam received. It will also send the end users a welcome email in the beginning to let users know their personal quarantine has been activated. If users would like to log in and see and adjust settings, they can do it using the login link in the email. If your domain has “Catch-All” enabled, then this option will not be available for use.For Exchange versions that do not have recipient verification enabled, please see here for instructions on how to enable this. This option allows you to restrict specific actions that are available via the user and domain reports. By default all options are enabled, howveer if you wish to disable the training or releasing options you can do this here. This will effect all users on the domain. By default the system applies no limits to the email size, and uses the size set by the destination mailserver. You can however set the maximum size for incoming and outgoing emails to be accepted by the filtering system. If the message exceeds the set up limit , it can either Rejected and stored in the Spam Quarantine or it can be Rejected with 5xx code(and not stored in Spam Quarantine) depending on how you set this up. You can specify which emails should be blocked based on the extension of the files attached. There is a list of some extensions added by default but you can add whatever extension type you want. If a file extension will be blocked the email message which contained the attachment will be quarantined. The additional restrictions options allows to to configure how many mime parts are allowed for a message, and the “message link size limit”. The message link size limit refers to the “scanned link extensions” below. As malware will often be of a small size, we would recommend to set this to around 2MB maximum. By default when a message is sent with a link inside the email, the content of this link is not downloaded. Here you can configure this. For example, you can add “.zip” and “.rar” to this list, and if a message is sent with “http://example.com/mybadfile.zip”, then the “mybadfile.zip” will be downloaded and scanned. We recommend to never add things like “.php”, “.html” etc to this list. This page allows you to configure whitelisted senders for either the whole domain or specific users. For domain whitelisting simply add the domain (or email address) of the sender you wish to whitelist in the "Sender" part, and leave the "Local-Part" empty. Wild-cards are possible here when whitelisting senders. In the Default Senders tab, you will be able to see the addresses that have been whitelisted by default for the entire cluster. You can choose to use those addresses or not, by simply selecting between Yes and No for the Use Default Values. The recipient whitelist is used when no filtering of the recipient is needed. Any recipient added here will have all messages delivered without any filtering. To add a recipient to the list, you need to use the Add whitelist recipient button and in the new pop-up screen, you only need to add the local part (the part before the @). To view the Existing entries, once you get to the Recipient Whitelist Section, you need to click on the Show Results button. In the Domain recipients tab only the recipients added for this domain will be returned. In the Default tab, you will see addresses that have been whitelisted by default for the entire cluster. By default the "abuse@" and "postmaster@" addresses are added. You can choose to use those addresses or not, by simply selecting between Yes and No for the Use Default Values. To allow the domain administrator or email user to remain in control over the filtering, it’s possible to blacklist a sender. The check works based on the MAIL FROM (envelope-sender) provided by the sender at SMTP level and the From address that is visible to recipients or both. The MAIL FROM might be different from the From: address. Messages from blacklisted MAIL FROM (Envelope-senders) addresses are rejected at SMTP level and are not quarantined. Messages from blacklisted "FROM:" addresses (if different) are quarantined. For domain blacklisting simply add the domain (or email address) of the sender you wish to blacklist in the "Sender" part, and leave the "Local-Part" empty. Wild-cards are possible here when blacklisting senders. In the Default Senders tab, you will be able to see the addresses that have been blacklisted by default for the entire cluster. You can choose to use those addresses or not, by simply selecting between Yes and No for the Use Default Values. The recipient blacklist is used when the mentioned recipient should not receive any email. Any recipient added here will have all messages blocked. To add a recipient to the list, you need to use the Add blacklist recipient button and in the new pop-up screen, you only need to add the local part (the part before the @). To view the Existing entries, once you get to the Recipient Blacklist Section, you need to click on the Show Results button. In the Domain recipients tab only the recipients added for this domain will be returned. 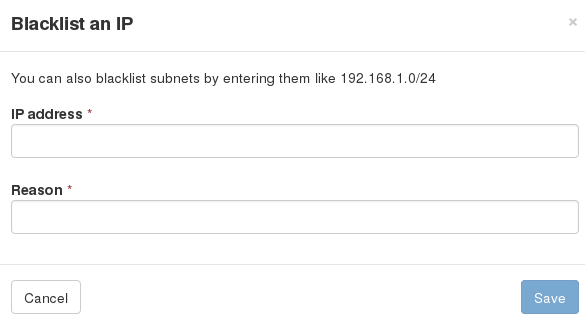 In the Default tab, you will see addresses that have been blacklisted by default for the entire cluster. The Archive settings page allows you to configure specific options for the domain. Including the number of days to store email, and what parts of the message you want indexing. Please note, if you require to add password protection to archived data for users(for security reasons), this needs to be done in the admin settings page. On this page you can check the status of your Archiving service. As a Super-Admin you will see the following parameters, including the ones from above if you go to your domain (Super-Admin Dashboard – Overview – Select a domain – Archiving – Status). On this page you can manage the archived recipients for your domain. You have the options to manage all recipients, a list of specific recipients, or all recipients except a list of recipients (for example a journaling address). The list should be separated by a space ( ) or a comma (,). Also, please provide only the local part of the recipient’s email address. For example only add “test” from the “test@example.com” email address. 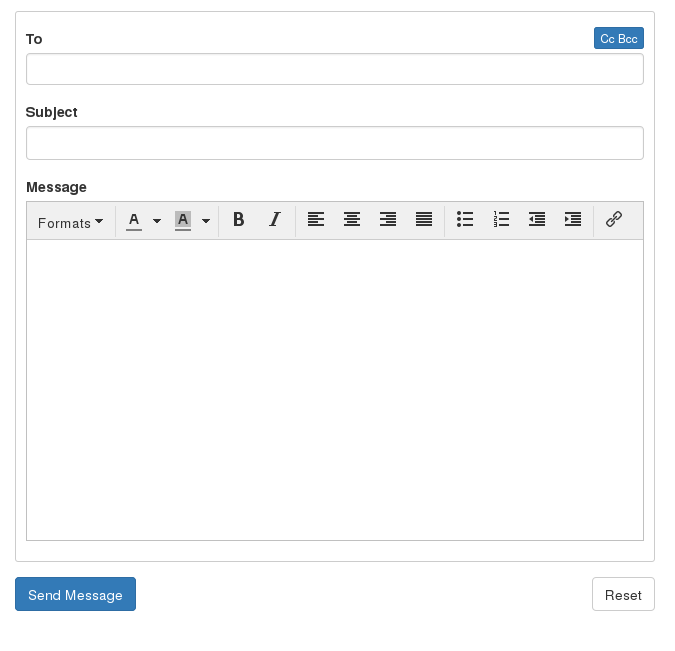 With this function you can manage email users. These users can log into the Control Panel with their email address to see their own quarantine, and manage their specific email settings. Please ensure that the domain you are creating the email for already exists on the server, and when setting the password, the password must contain lower case letters, at least one upper case letter or one digit, no spaces, and must be 6-25 characters in length. Only ASCII characters are supported for the local part. You may also upload a Comma Separated Values (CSV) file. Each line in the file must contain at least four columns, the username, the domain, the password and the status. 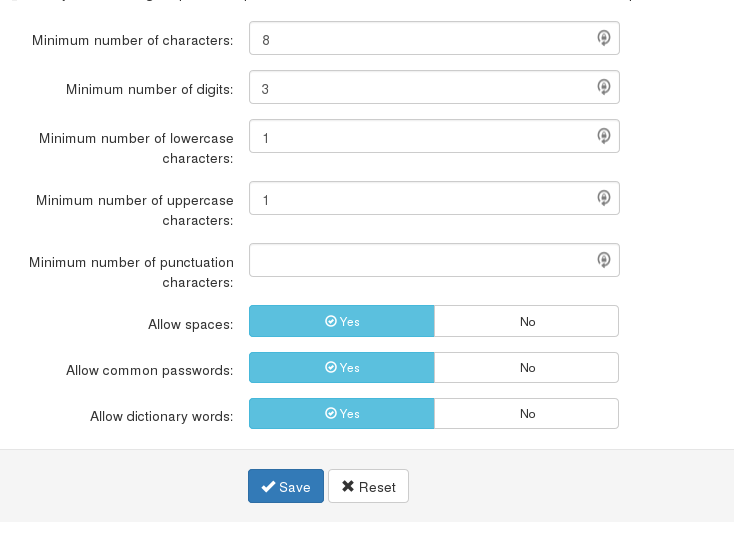 The password must contain lower case letters, at least one upper case letter or one digit, no spaces, and must be 6-25 characters in length. As a higher level user, you also have the ability to “Login as user”. With Require 2FA an Administrator or Reseller or Domain user can require specific users, or all users, to use 2FA. If a user didn’t previously have this enabled, they will be prompted to set it up on their first login after it’s requested. In this section you can manage specific permissions for available user roles and for individual pages for user levels. On this page you have the option to configure the global password policy for all your users. As a Super-Admin you also have the option to enforce Two-Factor Authentication (2FA) for user types, such as super-admins, admins, domain users or email users. Domain Overview contains a list of domains, domain aliases, destination routes, and ports for which your email filtering system accepts email. Also active services present on each domain are displayed as small green boxes by each domain name. To add a domain, click on the Add Domain button in the welcome user dashboard. You can optionally upload a Comma Separated Values (CSV) file to add multiple domains at once. Always add the domain to the interface before changing the MX records to the new cluster MX records, because in this way the correct route for the destination mail server will be added automatically and no mail will be rejected. Click on the Dashboard → MX verification tool under the Domains menu section. Enter your valid MX hostname(s) and click start verification. The above are by default unchecked. Here you can add your domain(s) and we'll verify your ownership. Simply follow the instructions, for example, add a domain "example.com". Then you need to add the CNAME you are provided with. Checks will be performed periodically to validate the domain, until we find your CNAME record in the DNS settings. Here you can also check if the domain has been validated or remove the domain validation process, by clicking the left-hand side button as shown in the below screenshot and choosing your appropriate action (Check or Remove). You should leave the CNAME in place for re-verification. Don't remove it. The Bandwidth Overview feature will display the bandwidth usage per domain for a given time-frame. 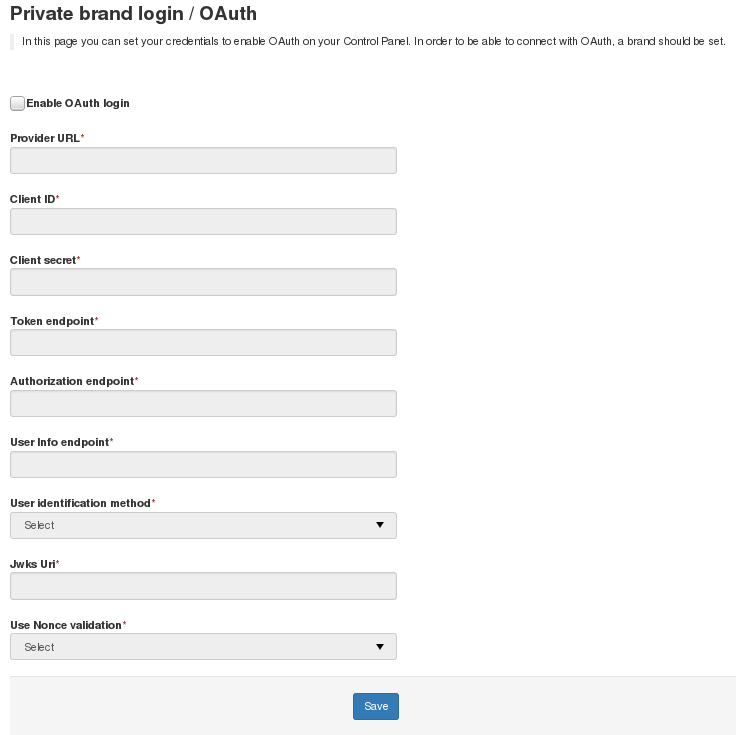 OAuth can be set up at Super-Admin, Admin, and Sub-admin level when the Private Label feature is enabled. It is applied based on the Custom Hostname that is set for the branding. Login to the Spampanel interface, and navigate to the OAuth section. In the branding section, you are able to set custom colouring and logo for the web interface, and set a custom address to access the interface, either using a TLS certificate you provide, or having us obtain and manage a certificate for you. The brand name is shown in the copyright of the control panel, in the Protection Reports, and in the headers of scanned emails. Your site logo is displayed in the header of the control panel. Note that the managed certificate cannot be used if the custom hostname is not valid. Specify the custom hostname. This hostname will be used by your clients to log in to the interface. Specify a relevant brand name. The brand name is shown in the copyright of the control panel, in the Protection Reports, and in the headers of scanned emails. Your site logo is displayed in the header of the control panel. Note that the managed certificate cannot be used if the custom hostname is not valid. Upload your branding logo and your favicon. 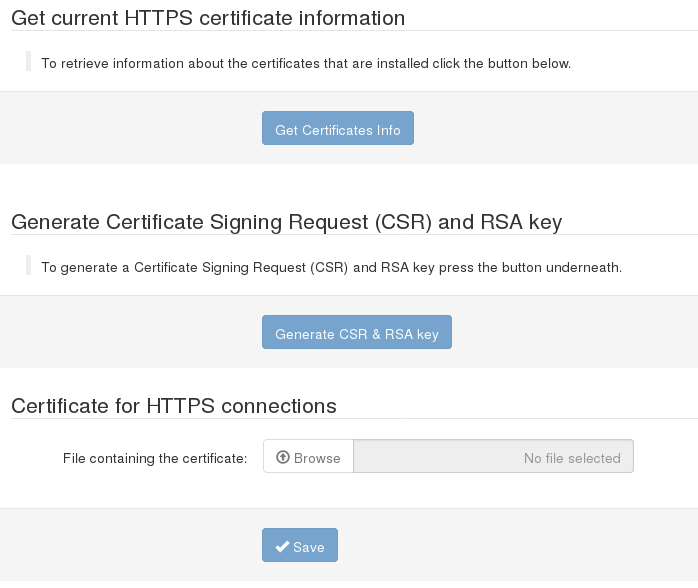 In this section, you will be able to choose between, not using a certificate, having us generate and manage a certificate for you (courtesy of Let’s Encrypt), or uploading your own custom certificate. Let’s E ncrypt - with this option, a certificate will automatically be generated for the hostname that you chose to use, and automatically renewed as required. Upload your own certificate bundle - this allows you to upload your own certificate. For more information, please review our article here. With the colour scheme, you can choose for each level: Admin, Domain, Email users to have different colours when they log in to the interface. The content of the HTML report may be customized via the API/webinterface. By default, it includes the quarantined messages table, but does not include the table of messages that were rejected without quarantine, this setting can be adjusted to show both tables. Show subjects as links in the message view. Clicking the “Control Panel API calls” function will direct you to the help page. Here it will give you a comprehensive guide to all the calls used. 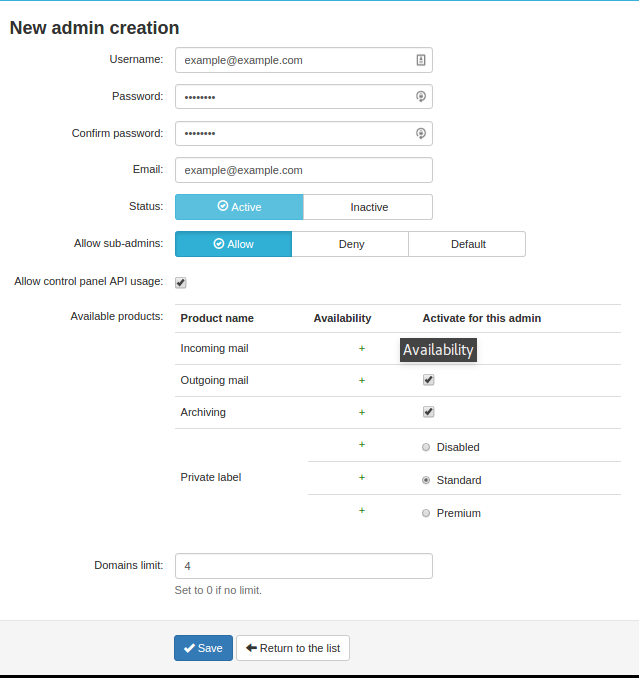 The Control Panel API allows you to automate the process of adding/removing domains to admin accounts, allowing your customers/admins/sub-admins to use a one-click-login solution and modify the settings of the domains in the system. You can also use this account with our range of add-ons. Your API username is your Admin username. The option enable Control Panel API must be enabled from the user settings, Dashboard > Webinterface Users > Manage Super-Admins/Admins. The settings page allows you to configure your Administrator settings. The Support URL relates to the "Support" Link in the top right corner of the interface. Here you can configure a direct support URL for you configured sub-administrator with configurable parameters. Support URL: The URL to re-direct admins too. Parameter name to send Email Value: The email parameter to be used. This option is designed to help prevent "ClickJacking". By default the login screen will always be protected with "Same-Origin" regardless of any setting made here. The "Allow from URL" option allows you to define a specific URL that is able to load IFRAMES of the interface. Please note, that when generating the CSR, the Private key will be displayed. Please make sure you save this locally temporarily as this is not retrievable after you navigate away from the page. To set a certificate, you need to make sure that the following parts are in your .PEM file. The notification template page allows you to customize the following notification templates. Email security check - This templates is ued the the Exchange catch-all check only. This page allows you to check historic API calls made by your domains. You can either define a specific "API method", or simply input a domain name to see historic logs of actions. This page allows you to configure whitelisted senders for either the your domains or specific users of your domains. If no search criteria is used, then all entries will be displayed. If you want to search for a specific address, you will first need to populate the Query Rules. By default, only the Domain and Address fields are selected. You can adjust this by using the drop down list, or add new Rules by using the New Rule button. In the Default Senders tab, you will be able to see the addresses that have been whitelisted by default for the entire cluster. To add a recipient to the list, you need to use the Add whitelist recipient button. In the new pop-up screen, you need to select a domain from the drop-down list and add a local part. To view the Existing entries, once you get to the Recipient Whitelist Section, you need to click on the Show Results button. In the Domain recipients tab only the recipients added for your domains will be returned. In the Default tab, you will see addresses that have been whitelisted by default for the entire cluster. By default the "abuse@" and "postmaster@" addresses are added. This allows you to specify which senders are not able to send messages to specific recipients of your domains or to all recipients of your domains. In the Default Senders tab, you will be able to see the addresses that have been blacklisted by default for the entire cluster. This allows you to specify which recipients are not to receive any email. To add a recipient to the list, you need to use the Add blacklist recipient button and in the new pop-up screen, you only need to add the domain and the local part (the part before the @). With this option you can manage your Administrators to have access to the Control Panel and configure their specified products and services. You can either add the Administrator(s) one by one – Add button or you can upload a Comma Separated Values (CSV) file to add multiple users at once. Each line in the CSV file must contain at least four columns, the username, the password, the email, the status and the domain’s limit (domain’s limit should be set to 0 if there is no limit). Please ensure that when setting the password, the password contains lower case letters, at least one upper case letter or one digit, no spaces, and is between 6-25 characters in length. With Require 2FA a Super Administrator or Administrator or Domain user can require specific users, or all users, to use 2FA. If a user didn’t previously have this enabled, they will be prompted to set it up on their first login after it’s requested. At the top of the page there is an option “Overview of bandwidth usage” where you can find an overview of the bandwidth usage for incoming/outgoing email per admin for a given time-frame. This option allows you to turn on the view/export protection for messages (assuming email archiving is enabled). Once this option is enabled, archived messages will only be visible/exportable after authentication as the user to whom the message belongs. While this option is turned on, sub-admins cannot override it. With this function you can manage the domain users. These users can login using their domain and the set password to manage their domain specific settings.You can either add individual users or multiple users at a time by uploading a CSV file. With Require 2FA an Administrator or Domain user can require specific users, or all users, to use 2FA. If a user didn’t previously have this enabled, they will be prompted to set it up on their first login after it’s requested. With the Global Statistics (Super Administrator) users can view the incoming statistics for a given time-frame (Hours,Days,Weeks,Months,Years). The Incoming IP whitelist can be used to SKIP certain filtering methods. Hence if you skip a filtering method which is actually reducing the spam score, such as content check, chances of messages being blocked may increase by skipping certain filters. Therefore we recommend only to skip checks for very specific situations to overrule the overall system, and to avoid messages being falsely blocked. To whitelist an IP simply click "Add IP". Traffic from IP addresses listed on the IP blacklist will get immediately rejected. The messages are NOT quarantined. All messages from blacklisted IP addresses are rejected with a 5xx SMTP error code, so legitimate sending SMTP servers will generate a bounce message to the sender. You have the option to add, edit and delete IP addresses, as well as adding a reason for why you blacklisted the respective IP address/range. 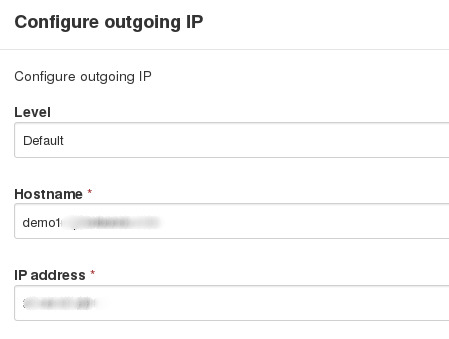 To blacklist an IP , simply click "Add IP"
This page allows you to configure an identity to use a specific set of IPs, or all identities for an outgoing user or domain, or all users and domains that belong to a specific admin. You can also set the interfaces that should be used by default, if you haven't chosen a specific set of IPs for a user. You'll need to ensure that your users know that they need to have the IPs that you have selected for them in their SPF records. The IP address (any) indicates that the OS will choose, which will be the Primary IP of the server. The Query rules allows you to filter on specific criteria when showing results. Columns are also customizable. If you are seeing problems with sender verification, you can see exactly what the sender's mail server responds when the address is checked. If you are seeing delivery problems, you can see exactly what the destination's mail server responds when the recipient is specified. You can see whether a mail server appears to be an "open relay", accepting mail for any destination. You can see whether a mail server appears to be a "catch-all" for a specified domain, accepting mail for any address at that domain. You can check the full SMTP delivery process to a destination, to see exactly what the destination responds in answer to each of the SMTP commands, and the final message content. The tool will go as far as the information provided. If a recipient is not provided, then the connection will end after "MAIL FROM", and if a message is not provided, then the connection will end after "RCPT TO". If you have a message in the DATA section, this will send an email to the specified recipient. To test deliverability issues from a specific server in the cluster, or IP assigned to a server, select the relevant IP. If left blank, then one of the control panel IPs will be used. For a user to be able to log in to the interface, they need to visit the Login page. Email Users will log in using their email address and password. This section also allows you to change the password in case you have forgotten it. It also allows email users to automatically add themselves as Interface users by using the Retrieve log-in link. In the text box the user needs to add their username and click submit. This will generate an email to their assigned address, which will include details on how to change their password. This way, the user will simply need to click on the submit button to receive the password change email. Alternatively, if a POST request is issued for the customized link the password change email will be automatically sent.